I have seen this idea around the internet and in a few magazines at the checkout counter at the grocery store. It is such a fun idea to make for dinner for your little goblins and on Halloween night. Of course, all of those recipes are filled with gluten and dairy, so I had to change it up. 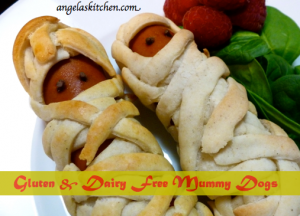 🙂 I also used nitrate free dogs to make things a bit healthier for my family because that’s how I roll… Based on my Gluten Free Dairy Free Pigs in a Blanket recipe, this is an easy recipe to whip up before heading out for trick or treat. Enjoy! In the bowl of a stand mixer, combine the flours, xanthan gum, salt, yeast, and sugar. In a measuring cup, combine the water and 3 tablespoons olive oil. Add olive oil-water mixture and egg to dry ingredients, mixing well. Scrape down mixing bowl then beat on high speed for 4 minutes. Place plastic wrap on counter. Divide dough into four pieces. Pat out one portion of dough into a rectangle using oiled hands on the plastic wrap. Using a pizza cutter or sharp knife cut the rectangle into squares, then each square into strips. Pat a hot dog dry. 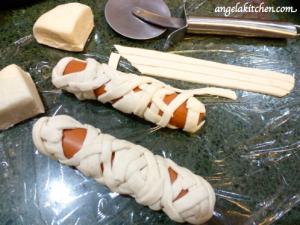 Wrap strips of dough around the hot dog for the wrappings on your "mummy" pressing ends a bit to seal to other dough piece. Repeat with remaining hot dogs and dough until all 8 hot dogs are wrapped in dough. Place on an oiled baking sheet. Allow the dough to raise for 15 minutes. You can brush the hot dogs with an egg wash of 1 egg mixed with 1 Tablespoon of water or leave as is. (In the photo the dough that baked up more golden had the egg wash and the other did not. Both are equally tasty!) Bake in a 400 degree F oven for 12-15 minutes until dough is baked through and golden. You can use gluten free sprinkles for the eyes or a dab of gluten free mustard or ketchup.